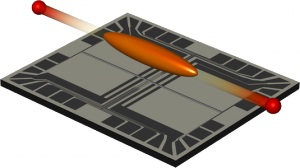 Exploiting our atom chip, and the highly sensitive fluorescence imaging as key tools in our experiment, we were able to perform various experiments in matter wave quantum optics. 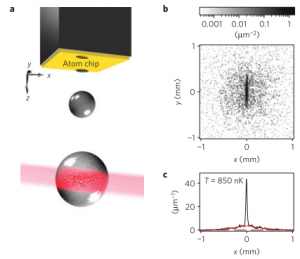 Matter as waves: atom optics. Particle-wave duality, the interplay between wave and particle aspects of both light and matter, is at the heart of quantum physics. Soon after the wave character of matter had been proposed by de Broglie, interference of electrons and atoms was found, and matter-wave interferometry has now become a major field in physics. From the viewpoint of matter-wave optics, a Bose-Einstein condensate is strongly reminiscent of laser light. Both can appropriately be described as a macroscopically occupied bosonic field mode, that behaves similar to a classical wave, coining the term “atom laser” for a propagating BEC. Light as particles: quantum optics. Conversely, the corpuscular nature of light is especially evident in typical quantum optics experiments, that involve measurement of correlation functions as introduced by Glauber. In several key experiments, purely classical (i.e., non-quantized) theories of light were ruled out by violation of classical inequalities. By now, quantum optics provides versatile tools for engineering all kinds of exotic quantum states, which have reached the level of first applications. Matter waves as particles (again): quantum atom optics. While the corpuscular nature of matter is hardly surprising, the toolbox of quantum optics can still be fruitfully applied to matter waves, in particular to ultracold atoms, where the quantum state populations are macroscopic, and wave-like phenomena such as interference and diffraction prevail. In the formalism of “second quantization”, indistinguishable particles are treated as quanta of a matter-wave field, in complete analogy to a quantized light field. This means, that in principle all the theoretical machinery of quantum optics can be readily applied to matter waves, giving rise to the field of quantum atom optics, where (mostly) atomic counterparts to quantum optics schemes are studied. HBT experiment: One obvious first step is to apply Glauber’s definition of coherence to ultracold gases, and second-order (or even higher) correlation measurements have become a standard tool of cold atom physics by now: In this measurement, it has been shown, that second-order correlations of the atomic field are changed drastically when crossing the condensation temperature, just as light when the emitting medium is passing its lasing threshold. A strong dependence on the geometry of the system was demonstrated, giving deep insight into the coherence properties of Bose-Einstein condensates, and how they are modified by interactions. Also, a specialised study for the deeply one-dimensional regime has been performed. Twin-beam experiment: Another branch of quantum atom optics experiments is dealing with correlated emission into paired modes, similar to photon pair creation in non-linear crystals as used for down-conversion or four-wave mixing. We implemented a novel technique to produce external-state twin-atom beams in a few-mode one-dimensional geometry. For the first time, quantum correlations in the strongly populated regime were demonstrated, by observation of almost perfectly suppressed population imbalance fluctuations between the twin beams. Furthermore, the Bose-enhanced dynamics of the stimulated population growth, was studied in detail. While further experimental tools will be necessary to prove entanglement or metrology gain, such measurements seem feasible in the foreseeable future.